Dieser Text ist zur Referenz. Der Text betrifft nicht die aktuelle CGoban / KGS- Version, was bedeutet, das eventuell einige Funktionen und Optionen nicht mehr wie beschrieben funktionieren. Wenn du Interesse hast, ihn zu übersetzen, dann lies bitte die Infoseite für Editoren und Übersetzer (betrifft die deutsche Übersetzung: oder setz dich mit mir in Verbindung. RuediRf). This english text is for reference. Be aware, that this text was written for an older version of the KGS-client. Some functions and options possibly don't work as described. If you are interested to translate this text to your language, please read the, 'help editors' page. Sorry, there are not yet many pictures here. I'll try to get them. KGS was designed from the very beginning to be the best server for teaching go over the internet. Anybody on KGS can teach, but learning how to use the KGS teaching tools best can take some time! This guide assumes that you already know your way around KGS; if you don't, then log in and try playing a few games and chatting some. Then come back and read here. When you are teaching, running a study group, or studying on your own on KGS, you usually don't use a normal game. Instead, you need an editable game, which adds extra ability to change the board. This page and the ones it links to explain the extra abilities available in editable games and how to use them. It is important that you read the first three pages given below; they contain information that is necessary to make sense of the editing and teaching system. After you read them, try them out. Then, when you need to or want to, read about moderation and live audio. They both require that you be authorized for teaching on KGS, and give abilities useful when you are teaching to a group or running a study group. In a normal game, there are two "roles" people have: a player, or an observer. In any editable game, the roles are different; there is a game owner, and player with editing control, and the rest of the players are observers. Editing control may be passed from one player to another. This page explains what these roles mean and how to use them. When you are teaching on KGS, you have different game types used for different types of lessons. There are demonstration games, review games, uploaded games, cloned games, and teaching games. That page explains the differences between them and tells you how to set each up. The KGS editing tools are used to put marks on the board, set up positions, etc. Knowing how to use them well is necessary to doing any teaching. The moderation system lets you control who talks and who sees it. It is useful when you are teaching large groups; without using moderation, there is often so much chatter that it is difficult for students (and for you) to tell what is going on. The live audio system lets a teacher talk into a microphone; all the students will hear. The students can then type their answers back to the teacher. 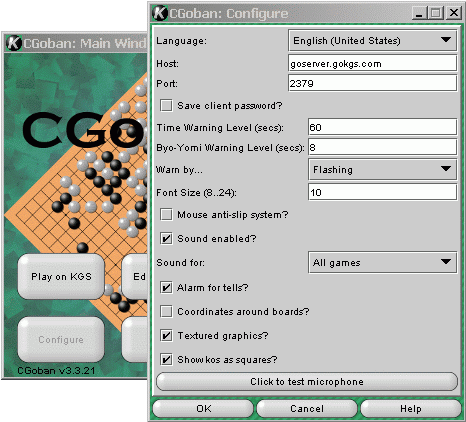 To prevent lessons and study groups from collapsing in confusion as multiple people try to make changes to the game board, every editable game has two special roles: the game owner, and the player (pupil, observer) with editing control. The game owner can, at any time, take editing control, or assign editing control to somebody else. See the editing control section for more information on what this means and how to do it. If the game is a teaching game, then the game owner may choose when to switch between play mode and editing mode of the game. If the game owner is an authorized teacher, then the game owner may use their microphone to turn on live audio. If the game owner is an authorized teacher, then the game owner may turn on moderation mode and manage the comments that people see. If the game is to be a lesson with a teacher and one or more students, the teacher should probably set up the game and become the owner. This will let the teacher take control over editing and make changes at any time. Otherwise, the teacher may have to stop to ask for editing control, which can slow the lesson down. Same game title as above, editing control has ... At any given time, there is only one player with editing control. It may be the game owner who has editing control, or it may be another player. Only the player with editing control may make changes to the game board. You can tell who has editing control by looking at the upper right of the game board (see the image to the right). The player with editing control may use the editing tools and may also give editing control to another player. If you give editing control to another player, you no longer have it, and may not make changes on the board any more. If you are the owner, you may take editing control at any time by choosing the "Take Control" option in the "tools" menu (see the image to the right). Other players must be given editing control, either by the game owner or by the player who currenly has editing control. The easiest is to use the "Give control to..." menu option under the tools menu. See the upper image to the right. This option will always hold either the game owner, or the player who had editing control just before you. If you want to give editing control to somebody other than the player who is in the tools menu, you must find the player in the user list, right click on theier name, then select "Give Control" in the menu that appears. See the screen shot to the right for an example. (Text from another page:) Everyone can teach on KGS, but special moderation and teaching options are only available for those with a teacher account: audio sending and moderation of comments in any of the editable game types (demo, review, teach, cloned, uploaded). The moderation system is designed to make it possible for teachers to manage very large classes. When the number of students gets large, it becomes difficult to manage the chat; what the teacher writes can easily be drowned out by all of the chatter from the students, or if the teacher wants to address only some of the comments or questions, it can be difficult for students to tell which of all the comments is being answered. A typical use of moderation would be for the teacher to demonstrate something, then ask (using live audio or typing), "Any questions?". The students all type their questions; the teacher then selects a few to show to the students and answer. So the students will not see the questions that their teacher chooses not to answer, keeping the game chat very clean and understandable. Moderation can be used in any of the editable game types. The teacher must have an authorized teaching account. The students in a moderated game will see several differences. First, when moderation is turned on (or when they join the game), the text "(Moderated Chat)" will appear in their chat window. While the game is in moderated mode, anything that they type will be dim on the screen, with "(Moderated)" in front of it (see the example here). The student will not see any comments from other students unless the teacher chooses to show the text; comments that the teacher has chosen to display are shown in black. If your own text is chosen by the teacher, then you will see it twice - once in grey with "(Moderated)" in front of it, then a second time in black after the teacher has chosen to show it. First, you must create a game that is one of the editable game types. Once you create the game, it will always start out in normal (non-moderated) mode. To switch to moderated mode, go to the "Tools" menu in the upper left corner of the game window, and click the "Quiet" menu option to check its checkbox (see the image to the right). When you want to turn moderation off and go back to normal chat, just go back to the tools menu, and uncheck the box next to the "Quiet" menu option. Chat will go back to normal, with every student hearing everything that the other students say. Once the moderated mode is turned on, the chat box of the game window will have two tabs added to the top of it. One will be labelled "game chat," the other will be "moderation" (see the example here). The "game chat" tab is much like a normal chat box for a game; anything that you type at the bottom will be seen by all students, and above that you see everything that the students have seen. To see the comments that students are sending you, click the "Moderation" tab. The game chat disappears; the entry field where you can type comments disappears as well. It is replaced by the text coming from students, a "Pause" checkbox, and an "Accept" button (see the illustration). Here all the comments from students are visible. You can browse as you want, reading as many (or as few) comments as you want. If the comments are coming too fast and you can't keep up, check the "pause" checkbox. This will stop the comments from coming in. To start accepting new comments again, simple uncheck the "pause" checkbox. Note: Students will not know that you have paused the chat, and can continue to send you messages. If you find a question or comment that you want everybody to see, you can either double click on it, or click it once and press the "accept" button. The comment will appear gray in the moderation box, and will appear both in your "Game Chats" box and in in the chat box for all your students. You can turn moderation on and off as you wish. It is up to you to judge whether the free-for-all nature of normal mode or the more controlled moderated mode is best at any give time. Using Audio sending features is restricted to users with an authorized teacher account. KGS supports adding audio channels to teaching games. When this is done, it makes one-way communications; anything that the teacher says, the other players in the game can hear. This is an excellent way for teachers to hold group lessons; they can talk, and students can type back any questions. All you need is to have sound enabled on your system. There is a checkbox in the preferences window that lets you turn off audio comments; make sure that this is turned on! Make sure that your speakers are connected and turned on! Then you should be ready to go. Note: On some systems, especially Linux, java does not interact well with other programs that need to play sounds (see also in the FAQ). If you do not hear sounds, or if your KGS client freezes when it tries to play a sound, try completely closing all other sound-using applications (including your KGS client). Then try restarting the KGS client and see if that solves the problem. Later versions of java are better in this way, so you may want to try upgrading your Java installation. Only players with a "teacher" authorized account may set up live audio games. If you need your account to be changed in this way, please contact admin@gokgs.com. Once your account is properly configured, you must have a microphone connected to your computer. Once you meet those two requirements, you are ready to start! First you must test your microphone, then you must create the game, then you must turn on audio in the game. The "Test Microphone" button Testing the microphone is done by starting CGoban and pressing the "Configure" button (see picture left). This will open up your configuration window; at the bottom is a button to test the microphone . Clicking that opens up the "Microphone Test" window (see the bottom picture). Make sure your microphone and speakers or headphones are connected properly to your computer. If possible, open up your operating system's "sound mixer" or "audio level" tool, and make sure that your microphone's volume or gain is set as high as possible. (Exactly how to do this depends on your operating system. If you can't find the tool, then don't worry; using it will let your students hear your voice more clearly, but usually your micrphone will work without using this tool). Now, press the "start recording" button in the "Microphone test" window. Talk into your microphone for a little bit; just saying a sentence or two should be enough! Once the "start recording" button has been pressed, the "play back" button will become usable. When you have finished talking, press "play back." When you press "play back," two things will happen: the bottom "Test results" section of the "Microphone test" window should change, and you should hear your own voice! If you don't hear your voice, or if the "play back" button doesn't become enabled, then "Test results" should give you a hint about where the problem is. 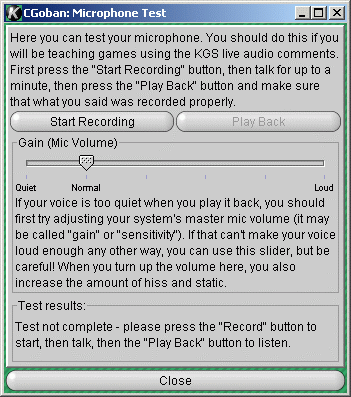 If you heard your voice, but it was too quiet (or too loud), then adjust the "Gain" lever (in the middle of the "Microphone Test" window) and repeat steps 3 and 4. Keep doing this until the volume of your voice sounds about right to you. Once you have completed these steps, you are ready to go! You can close up your "microphone test" and "configure" windows, you won't need them any more. Important note: As of this writing, there are bugs in the KGS audio system that you should be aware of. Some people report that they can record once, but if they stop recording and start again, they hear only static. If this happens to you, then after each "Start Recording"/"Play Back" loop you will have to completely exit from CGoban and restart. Later versions of java seem to be better about this, so you may want to try upgrading if you run into this problem. Once you have tested the live audio system, you are ready to use it! First, set up a teaching game. It may be any of the editable game types, but you can not use live audio in a simul game, free game, ranked game, or tournament game. Find the "Record Voice?" checkbox (see the picture on the right). This only appears when your account is set as a teacher, and you are the "owner" of the teaching game. The "owner" is always the person who created the teaching game, so if your student sets the game up, you will not be able to use live audio! Make sure you set the game up in every case. Once you find the "record voice?" checkbox, check it! 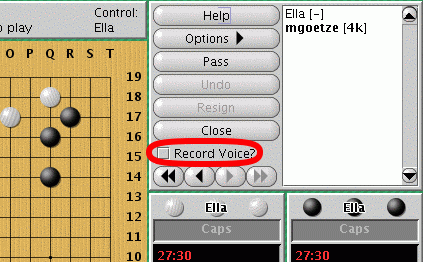 The text "record voice" will be replaced by a black rectangle. This rectangle is a level meter. It lets you know when students hear you; try talking into the microphone, a green bar should appear in the rectangle, it will move to match the volume of your voice. As long as you see this bar moving when you talk, everything should be going well! The bar also gives you a hint about whether your noise is the right volume for your students. If the bar turns yellow, that's OK, but if the bar is often red, then that means that the gain is your microphone is turned up too high, your voice will not sound good. Go back to the microphone test window, turn the gain down. You can do this even while in the middle of your lesson, just don't press the "Start Recording" button in the microphone test window! If you want to turn off the audio for a little bit (for example to answer a telephone call, or any other reason), just uncheck the box next to the lever meter, the "Record voice?" text reappears, and students will not be able to hear you talk until you turn your microphone back on again. Important note: As of this writing, there are bugs in the KGS audio system that you should be aware of. Some people report that they can record once, but if they stop recording and start again, they hear only static. If you turn off recording, then turn it back on, and your students complain that they hear static, then you must completely close all CGoban windows and restart it again. Only some people have this problem, so most teachers don't have to worry about it. Later versions of java seem to be better about this, so you may want to try upgrading if you run into this problem.